This year the Christmas lights are switched on the 30th in November, will you miss it? Don’t worry, you will find a video of the lighting and all the information you may need about Christmas in Malaga if you continue reading. The lighting decoration and switching date change every year, however in 2016 was the same as in 2015. In past events they used up to 600.000 led lights in Larios street, the most centric street in Malaga, nevertheless this city is one of the best places to enjoy the Christmas lighting in the world. Above you can see the 2018 lights. This year they were ready to be switched on the last Friday in November. Remember there will be light and sound shows at 6:30 pm, 8 pm and 9:30 pm every day. In 2018 the Christmas lighting and the light and music show will be the same as past year. This year they repeat design and lighting in the city centre, the design is inspired by the Cathedral of Malaga. This year there will be snow cannons in the main squares of the city like Plaza de las Flores or Soho district. The company responsible for Christmas lighting in Malaga (Iluminaciones Ximénez) which is also responsible for providing lighting to different companies and cities around the world. You can find its LED lighting in New York on Fifth Avenue, Las Vegas, Dubai or even in Hong Kong among other locations. Many visitors come from Europe not only to see the Christmas lighting in Malaga, but also to enjoy a festive atmosphere unique in the city. This year, the Christmas lighting will also be used for light and sound shows at 6:30 pm, 8 pm and 9:30 pm every day. There will be typical Christmas songs and each pass will last from 2 to 3 minutes. 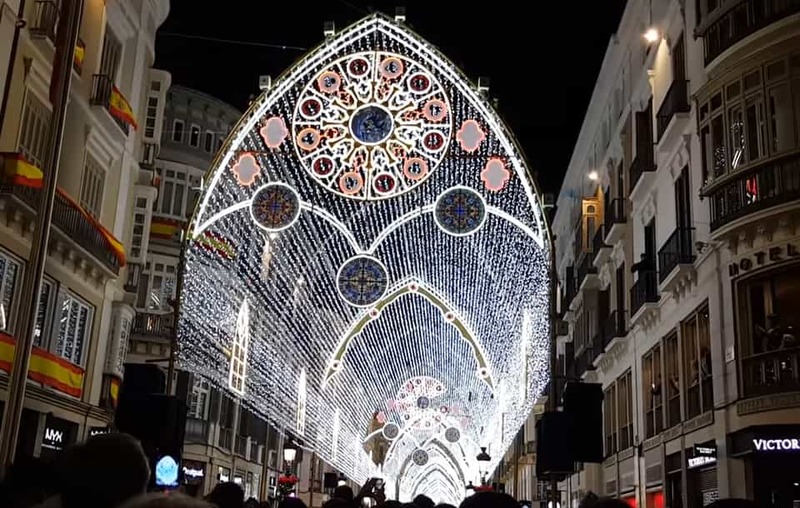 There will be new streets in addition to Calle Larios where you can enjoy the illumination: Calle Marqués, Sagasta, Souvirón, Plaza de Camas, Calle Herrera del Rey, Puerta del Mar, Calle Moreno Carbonero, Calle Álamos and Calle Granada. The Christmas lighting will be turned off on January 6th, with the arrival of the Night of Kings, so you better visit it before it is too late. This central square in Malaga is decorated for Christmas with a beautiful illumination offering a show that you should not miss. As a new there will be a visitable Christmas tree in the Plaza de la Constitucion. You will be able to visit the inside of the tree and take photos. During Christmas in Malaga six giant Christmas trees (6 to 18 meters high) will be placed. One of them in Huelin Park, two almond trees of 8 meters, one in the square of the Cervantes Theatre and another in Alcazabilla street. A giant Christmas tree with a metallic structure in the Plaza de la Marina, also another one of 18 meters in the Plaza de la Constitución, that you can visit the inside, a Christmas tree in the Plaza Enrique García Square and finally one in Molina Lario Street. All of them illuminated with leds and decorated for the occasion. Constitucion Square with Christmas lighting tree from a past event. In case you’ve missed it, this is the last video of the Christmas lights being turned on and some of the main attractions of the city this winter. Torremolinos Chrismas lighting is switched on the Friday 7th of December in 2018 at Plaza Costa del Sol at 8 pm. There will be musical performances from 5 pm in Plaza Costa del Sol and Calle San Miguel. 23 November is the inauguration of the Christmas lighting in Estepona and Fuengirola. November 30 inauguration of the Christmas lighting in San Pedro de Alcantara. December 1 is the lighting of Christmas lights in Benalmádena. 30 November is the inauguration of Christmas lights in Marbella, in Paseo de la Alameda. Many locals enjoy the Christmas in Malaga by visiting any of the many Christmas markets in the province. Those markets in the city are usually in the area of Soho and the Alameda park, but there are many other in the province. Initially I think the list will not be much different than the previous year, you can check our current list of Christmas Markets in Malaga. Every year they organize traditional nativity scenes, some of the most popular are the one inside Malaga Cathedral and at the Town Hall in Malaga. The Cathedral Nativity Scene will be available from Sunday 2nd of December. You can find a wide variety of hotels for the New Year’s Eve party with dinner included . If you prefer, you can celebrate in one of the main squares of the cities of Malaga, there typically meet a large number of people to celebrate the arrival of the New Year. In adition if you want to celebrate New Year’s Eve in Malaga with more people you can visit my other article with the incoming events for that night. The Three Kings in Malaga during 2019 will spend the night in the Alcazaba. The parade will leave from the city hall on Monday 5 January so you better be ready. Do you plan to spend this Christmas in Malaga? We hope you enjoy and don´t forget to share your experiences and questions in the comments below. Hello, it is supposed to happen the day we state in the article as it is the official date and time. This year there is not yet an official time for the music and light show, but we can expect to be the same as last year. Hi I’m a bit confused as to the date for the switch on of the lights, some say the 30th others the 24th. Which is the correct date? At malagaweb.com we always state the official date every year at the beggining of the article. It should be taken into account that while the Christmas lights in C/Larios are on until 6th January the last light show is actually on Jan 4th. There are no light shows on Jan 5th as the Reyes Parade is on. Thank you for letting us know Loraine, I was not sure about the last light show day.